By the grace of God, we began homeschooling our children 30 years ago. Now, both our children are married, and working with us in the ministry, and our grandchildren are being homeschooled. 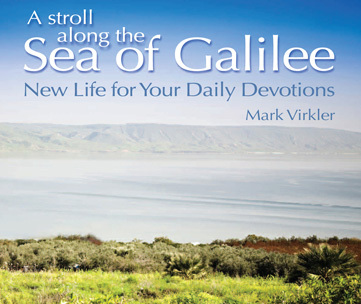 What a joy this is to our hearts! We have always been best of friends with our children. We learn together, work together and vacation together. What a heritage! God has been so good to us! According to the U.S.Department of Education, National Center for Education Statistics, homeschooled students have an average percentile rank of 77 on standardized tests, with 50 being the percentile of the average student. (A percentile of 77 means that out of 100 students, 76 scored lower.) 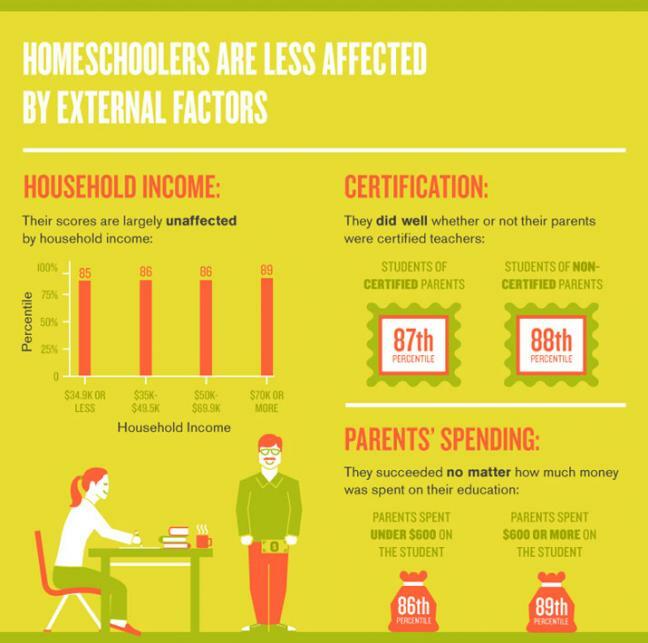 Other studies indicate the average homeschool percentile to be closer to 85. I know our children were always in the the higher percentiles when they took the mandatory standardized tests. 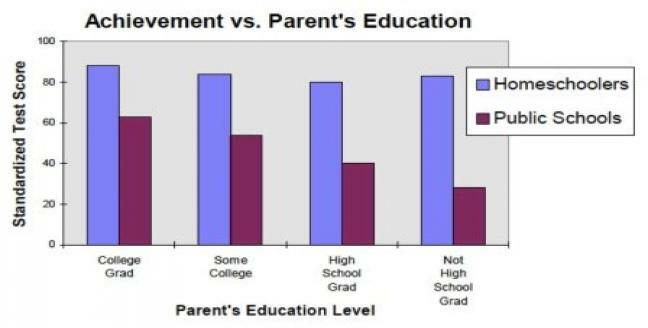 The following chart shows that the amount of education a parent has is much more significant for public schooled children than homeschooled children. In other words, homeschooled children still do significantly better on standardized tests than public-schooled children, even if their parents (presumably the ones teaching them) didn't even graduate from high school! So if you are dissatisfied with the level of instruction given in public schools, and the kind of training and socialization your children are receiving, and are wondering what else is available, we want to let you know that homeschooling is a wonderful option. There are tremendous homeschooling resources available to help any parent do an outstanding job, and there are homeschooling support groups in communities worldwide. The homeschool wave is growing exponentially. Do you want to jump aboard? Submitted by Anonymous on September 21, 2013 - 15:19. We homeschool our daughter and love it. It is certainly not for everyone, and the children that feel strong enough to carry their faith at school, well, that is awesome! Many time peer pressure and wanting to "fit in" overshadows evangelism, unfortunately. Our homeschooled daughter is being exposed to missions and how to care for God's people. We have so much more opportunity to pour God's love into her, so she can be a strong warrior and evangelize to her friends at community activities. Being a light for God everywhere you go is essential, not just in a school. Submitted by Anonymous on July 16, 2013 - 12:19. Submitted by Anonymous on August 11, 2013 - 12:57.